Do you, like me, sometimes feel that the EU is a faceless colossus with innumerable bureaucrats that you have no idea what they are up to? Well, some commissioners have now understood the power of online video. 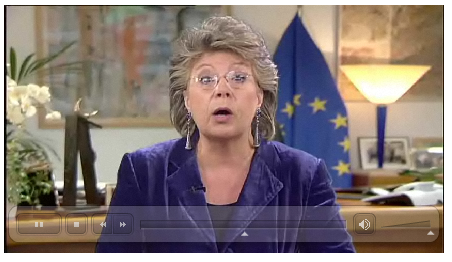 Just check out this weekly video from the EU Commissioner Viviane Reding. Click the picture to go to the video site. “I want all Europeans to be able to switch their phone operator ““ whether mobile or fixed ““ within one single day” A worthy cause indeed! Here you see a very human EU Commissioner and you feel her enthusiasm and drive for the issue she is presenting. The video is simple, but professionally done, she is reading well from a teleprompter. What a difference compared to just reading her press release! Why are not more leaders using online video like this? The video player should have an indication on how long the video is. This is essential, I want to know if I have the time or not available. The video player should have an embed-button, so that it is easy to embed the video in blogs and other web sites. This creates viral spreading. The text of her speech is downloadable as a PDF with a link next to the video. It would have been better to be able to read the text beside the video. Ideally the text should be navigable so that you can click on it to make the video jump to that part, like New York Times is doing. There should be an RSS feed so that I can subscribe to these videos in my RSS reader. It would have been nice to enable some form of viewer interaction. For example, have a poll about the issue mentioned, or allow comments to the video. Elegant and polite, but perhaps not the most time efficient way of responding. 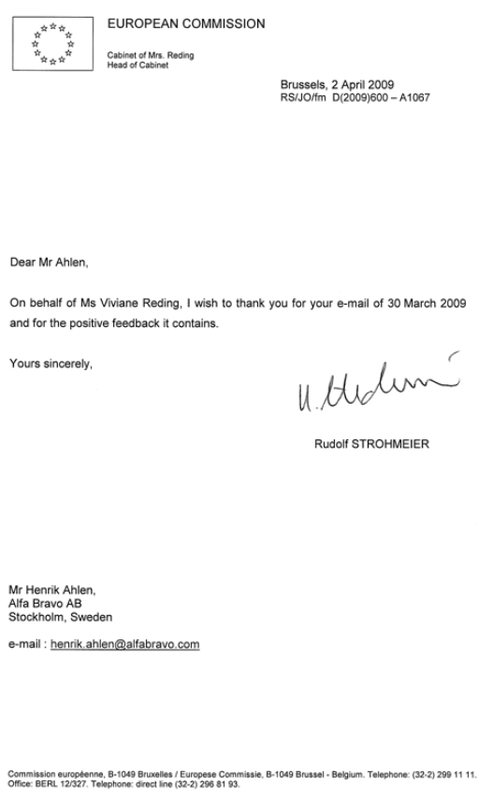 Could it be an EUÂ regulation that all emails have to be replied to on the official stationery?